Select from the topics below to view related questions. 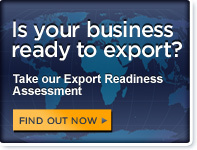 Do I need an Export Market Plan, and what should it cover? Where can I find U.S. and foreign trade statistics for market analysis? Where can I find product/country research for market analysis? What are my market distribution options; how do I determine which is best for me? What are my market promotion options; how do I determine which are best for me? What are my market pricing options; how do I determine my export prices? What are my market adaptation options; what can I do to be more accepted in culturally different markets? How can I locate importer, distributors, sales reps, etc in a overseas market? How can I learn more about my product's or service’s sales potential in overseas markets? How do I obtain market research for a specific country or product? What import duties and taxes might apply to my products in specific countries? How can I find out about investment practices in a certain country? How do I locate trade leads, buyers or distributors for my exporting business? Where can I obtain information on foreign markets and trade opportunities for fish and agricultural products? Can’t find the answer to your question? Identify the Pennsylvania County where your company is located to access the contact information for your local Regional Export Network Partner. © 2011 World Trade Center of Greater Philadelphia. All rights reserved.